We’re getting pretty excited: the Harbourside Christmas Market launches this weekend. Sixty stalls, a Market Bar complete with delicious mulled bevvies, the whole harbour decked out festive-style, and, of course, an excellent line-up of some of the best music we could get our hands on. Live music down at the Market is one of our favourite things about this time of year, and we’re delighted to share the great line up of bands we have for you this year. Come along: it’ll be more than carolling. Here’s who you can expect, plus a couple of great tracks to look out for. Upbeat rootsy Latin-American music: Cumbia, Salsa, Son, Currulao and more. Get ready to dance ’til you drop. 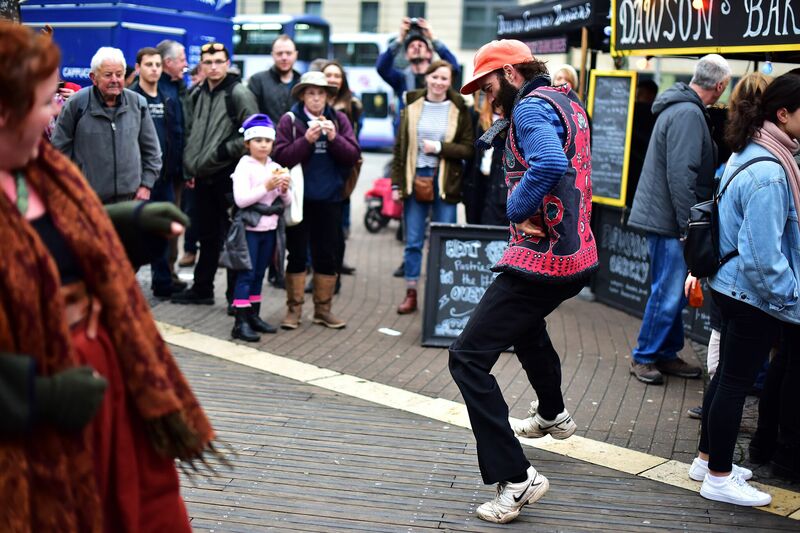 Beginning on the backstreets of Bristol, Snazzback have taken their soul-psyched afro-phunk street-jazz from busking on corners to festivals across the UK, including Shambala, Bestival, and Glastonbury. Join the electro-freakout. These guys are Harbourside Christmas Market favourites, having already helped everyone get their merry on last year. Don’t miss their delicious swing. A jazz guitarist-gone-Bhangra-DJ meets a theatre-born jazz and blues singer: what could go wrong? In fact, it goes very, very right, as their brilliant show at the Bristol Swing Festival proved. A full power Balkan House/Gypsy Folk duo, mixing gypsy and Irish fiddle with booming guitar beats. It’s often hard to believe there’s just two of them – if you think you hear a full band going around the Harbour this Saturday, we reckon they’ll be why. A fast paced outfit of ragtags with a beautiful blend of punk, pickled swing, klezmer, gypsy, Balkan, and blues. Has to be heard to be believed. A cellist, a violinist, and a guitarist walk into a bar (or the Harbourside Market) and… play some really good tunes. Epic folk music, slamming chords. An all-star funky brass band bringing that New Orleans style to Bristol. They play pop and funk classics in the tradition of the best American street bands, and have played with some of the best in the business including Kasabian, Tom Jones, Kellis, and Muse. Come along and be thankful they made Bristol their base. The blues solution to your woes. From piano and delta to jump and chicago styles, Kirris Riviere leads the bid for musical catharsis with verve. Here for you as you get the last of your Christmas shopping done!